Scott Snyder confirms we'll see what The Batman Who Laughs looks like under the mask – AiPT! Just how does he see in that thing anyway? 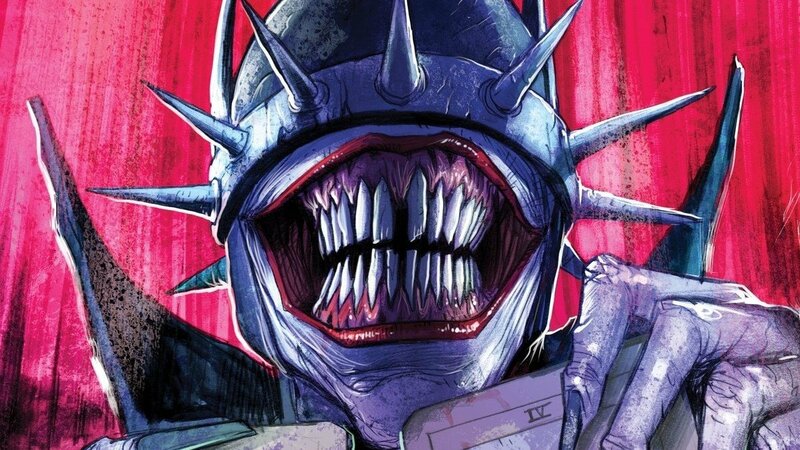 Warning: Spoilers from Dark Nights: Metal and The Batman Who Laughs ahead. After the Batman of Earth-22 was driven to the breaking point by The Joker he snapped his arch enemy’s neck, killing his long time nemesis (The Batman Who Laughs #1). The Joker’s death caused a toxin to be released from within his body, which was inhaled by Batman and immediately began rewiring his brain. The changes Batman underwent removed his moral compass but kept all of his skills and intellect intact, which led to the Caped Crusader gunning down the entire Bat-Family in cold blood and then destroying the Justice League. As his final act as Batman, Bruce used Black Kryptonite to force Superman and his son Jon to murder Lois before he destroyed them both. This transformed Batman into The Batman Who Laughs, one of the most feared and deadly individuals in the DC Universe. During the events of Dark Nights: Metal, fans watched The Batman Who Laughs recruit several other Bruce Waynes from across the multiverse, to form the Dark Knights, an evil Justice League formed entirely of different Batmans, and in the process destroy billions of lives and countless worlds. The Batman Who Laughs almost succeeded in killing Batman, destroying the Earth and plunging the entire multiverse into darkness for all eternity — so yeah, you could say he’s kind of a big evil badass. There’s a lot about this Batman that makes him scary and it’s not just the aforementioned events, serial killer side job and complete and utter lack of morals — it’s also how he looks. Frankly the guy is terrifying to look at; his lips appear to be either removed or completely shredded and his mouth is covered in some degree of blood at all times. The gums are pulled back from the teeth, which have been filed down to rigid fangs and of course (what would a Joker be without a scary smile?) his smile is huge and a constant source of discomfort. Then there are his fingernails, which are long and appear sharp enough to cut flesh and his outfit, which looks like it came straight out of Pinhead’s closet — appropriate given that this guy would love to hang you on some meat hooks. But what really sticks that unnerving feeling in your gut is his mask. You can’t see this creature’s eyes, and yet despite that it still feels like he’s staring straight into your soul and the spikes add a layer of pure menace and utter dread. He shouldn’t be able to see you and yet he does. If you really stop and think about it, how the heck does The Batman Who Laughs see? There’s a band of metal around his eyes and those spikes don’t appear to be see through, so what’s the deal? Sure it’s a comic book, you need to suspend your disbelief to a certain degree, but still there’s got to an explanation, even if it’s fictional. As luck would have it, I got the opportunity to speak with the creator of The Batman Who Laughs, Scott Snyder, during an interview at New York Comic Con. I asked a question that’s been bothering me about the character since I first encountered him in Dark Knights: Metal. I wasn’t disappointed. AiPT! : One last quick question. There’s a million theories about this on the internet, how does The Batman Who Laughs see through a spike plated visor? Snyder: Oh! We’re going to totally reveal that in The Batman Who Laughs and you’ll see his eyes. You’ll see. I promise. I feel bad for the cosplayers [laughs], I see a lot of them bumping into stuff. Finally! I’ve spent too many hours arguing and theory crafting on the internet with my fellow nerds for this question to go unanswered. The Batman Who Laughs #1 goes on sale December 12. Hopefully we don’t have to wait until issue #6 for a look underneath the mask and an explanation as to how this guy can see through spikes.